This application will help you to learn Italian language in easy and interesting way. You will find that phrases are easier to remember, because they have meaning, they paint a picture, they tell a story. 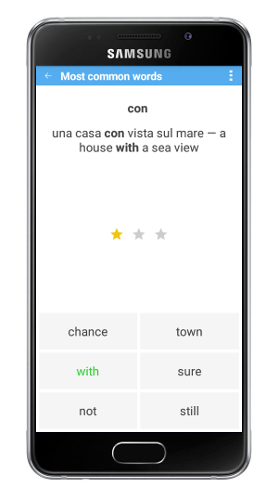 This application uses TTS (Text To Speech). Also each user can add their own dictionaries. The easiest way to create the new dictionaries is use a personal computer and spreadsheet-template (download itplus.xls for MS Office or itplus.ods for OpenOffice). I draw your attention that must necessarily be allowed to run macros. You can create your own XML-dictionary file in any text editor. italian_phrase="[Come] si scrive quella parola?" english_phrase="[How] do you spell that word?" italian_phrase="[questo] è il tuo posto"
italian_phrase="faccio questo lavoro [perché] mi piace"
english_phrase="I do this job [because] I like it"
You must use UTF-8 encoding. The easiest way to create the new dictionaries is use a personal computer and spreadsheet-template (download tests.xls for MS Office or tests.ods for OpenOffice). question="Come _____ Marco ed Anna?" Right answer must always be place in 'answer1' field and you must use UTF-8 encoding. You can also add your dictionary to our database.